For years women have fought to find a foothold in places which are dominated by males. Armed forces being one of them it’s only in the recent time that women have been recruited into the ranks that were occupied by men alone. Pooja Chopra whose next Neeraj Pandey’s Aiyaary is making a lot of buzz is all set inspire us with a role that breaks stereotypes. The beautiful actress will be seen playing the role of an army captain leading 4 men for a covert operation. 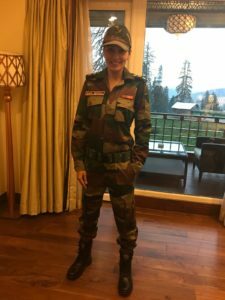 While in reality women face a lot of difficulties to achieve a proper space in the Indian force, Pooja through her character wants to reach out to all and urge to live their passion. The strong character played by the actress is an ode to all the strong women who find their foothold in a places dominated by men. Even during the promotions of the film at BSF Jaisalmer, the actress has displayed immense strength while doing the drills designed for Indian Jawans. She did a very difficult rope climbing activity there which she completed with perfection. We are glad women like her are setting an example for all the women out there!